Big Dipper central location units can treat kitchen drain flows between 4.73 & 7.89 liters per second, they are designed to treat flows from multiple fixtures in a central location like a basement or plant room. These Big Dippers are typically installed in higher flow establishments such as multi storey restaurants, hotels, casinos, prisons, hospitals, airports etc. Big Dipper Automatic Solids Transfer (AST) systems automatically separates and removes Fat, Oil and Grease (FOG) from drain water flow. A patented technological breakthrough allows incidental food solids and other debris found in the effluent to be separated from the FOG and pumped out of the solids retention area to the drain. The entire process is controlled automatically by a timer. The operation of the Big Dipper AST can be broken into two components. As dirty water containing free-floating fat, oil and grease enters the Big Dipper, the lighter FOG immediately separate, pass through the solids filter basket to the top of the retention tank, and are trapped in the FOG retention area. Heavier clean water exits under the outlet baffle. Any food solids or debris contained in the drain water entering the Big Dipper are separated by the filter basket and held in the solids retention area. Incidental solids and trapped grease are automatically removed from the Big Dipper. 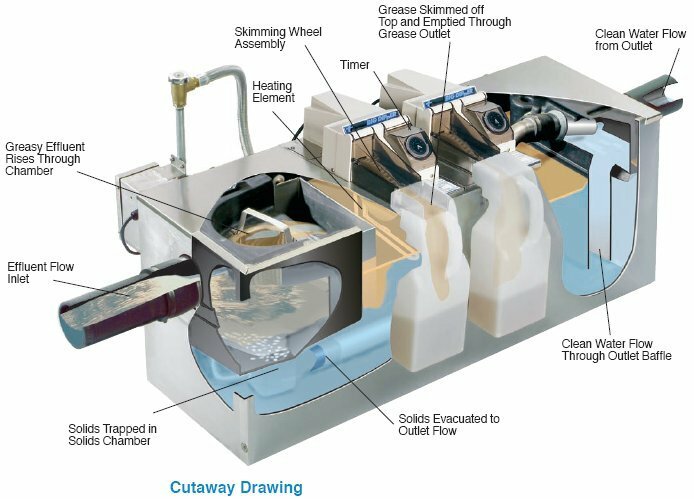 An internal timer periodically activates the solids transfer pump, which whisks the trapped solids out of the solids retention area and discharges them to the outlet of the Big Dipper to join the cleaned water exiting the system. Another independent timer is set to activate the fat, oil and grease removal process. When the timer reaches the "on" position, the electric heating element is activated and heats the system to 115-130º F. This ensures that all FOG is liquefied before they are automatically removed from the tank. Simultaneously, the motor which rotates the skimming wheel is activated. Fat, oil and grease adhere to the sides of the specially designed skimming wheel. A wiper blade assembly scrubs the grease and oil from the wheel. The skimmed fats, oils and grease are discharged to the collection container supplied with the Big Dipper.